Before we begin, few informations. 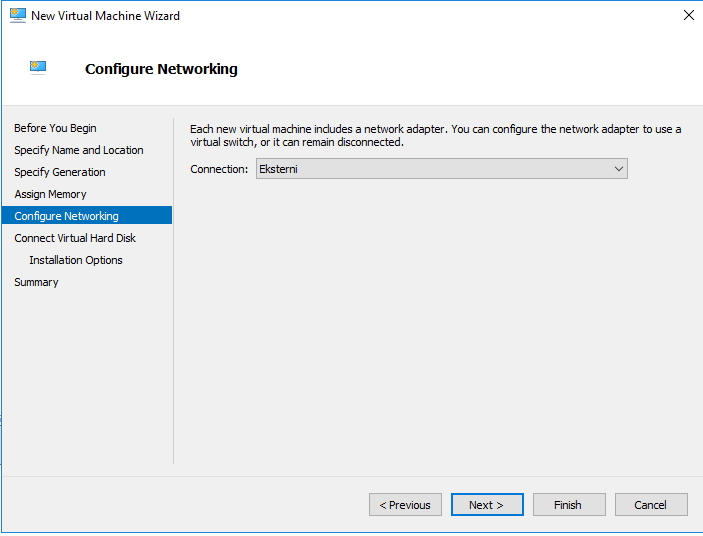 Follow that tutorial until it gets to the DHCP installation part (Adding DHCP to Failover Cluster). 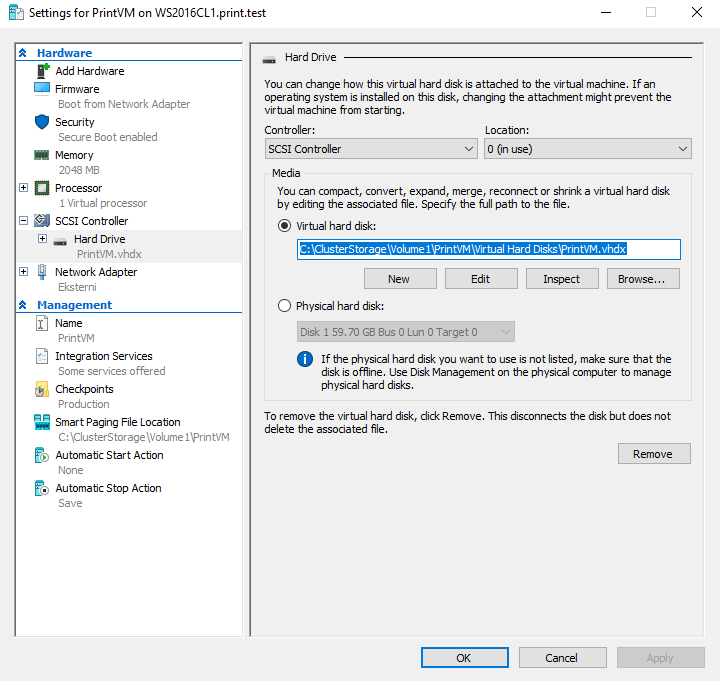 WS2016iSCSI – 10.30.30.5/24 – Windows Server 2016 Standard is DC for the LAB on which is also installed iSCSI Target. 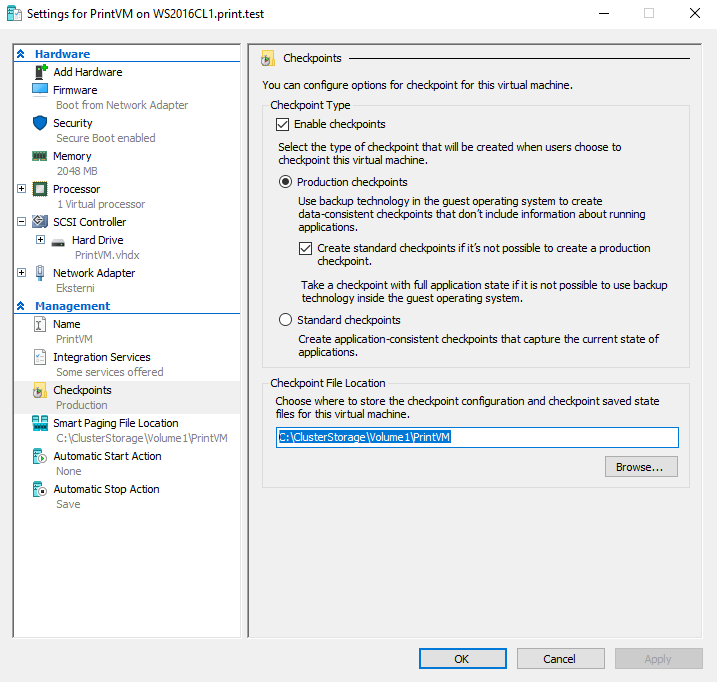 WS2016CL1 – 10.30.30.10/24 – Windows Server 2016 Standard – Failover Cluster Node 1. 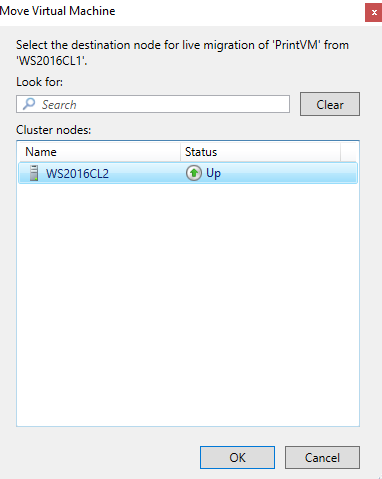 WS2016CL2 – 10.30.30.20/24 – Windows Server 2016 Standard – Failover Cluster Node 2. Private Network just for Failover Cluster is 192.168.30.20. 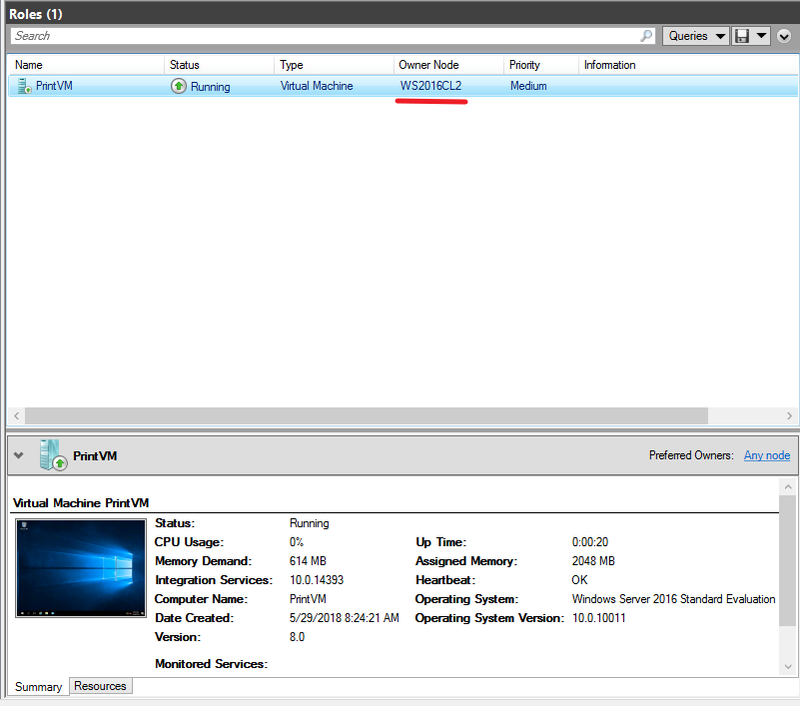 HyperVCluster is the name of the cluster and it is located on the IP address 10.30.30.50/24. 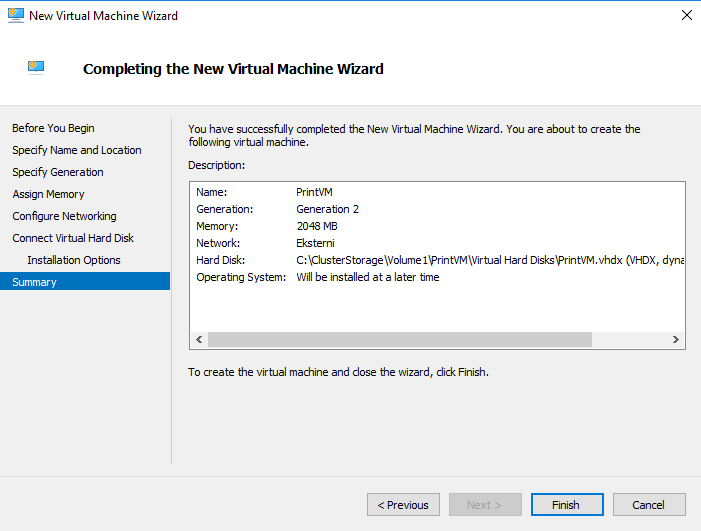 Virtual Machine that are we going to install is also Windows Server 2016 Standard and is going to be named PrintVM and its IP will be 10.30.30.60/24. 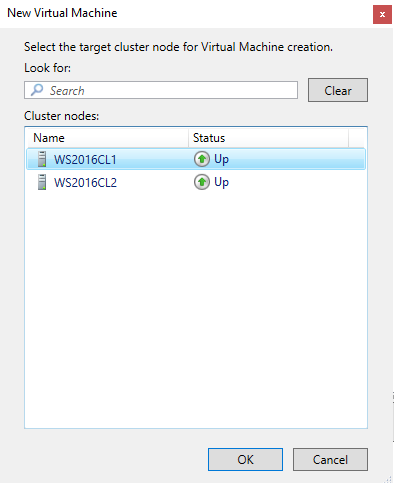 Cluster Shared Volumes on Failover Cluster – Storage in Failover Cluster that will host Hyper V needs to have Cluster Shared Volumes. 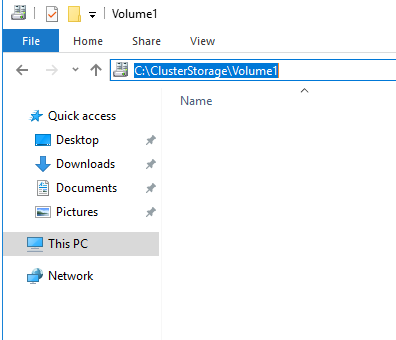 Info on converting storage to Cluster Shared Volume is covered in the tutorial for failover clustering. 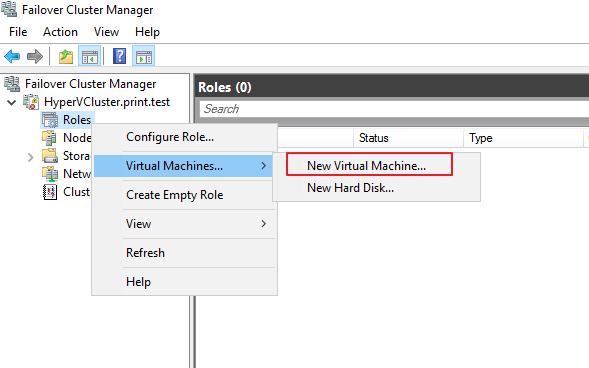 Hyper V Role has to be installed on both nodes. 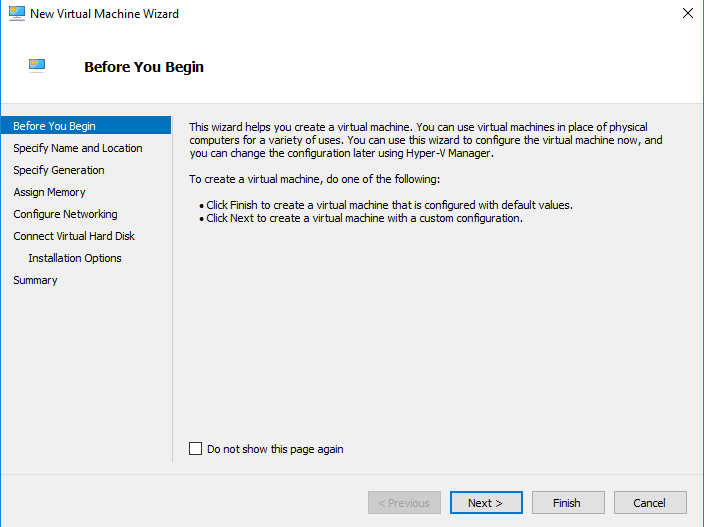 Hyper V Virtual Switch Manager should be configured and named identically on both cluster nodes. 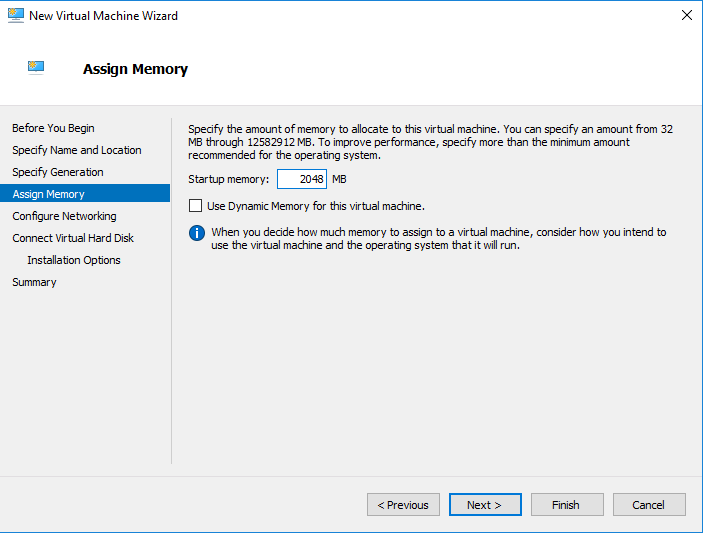 Hardware should also be identical on both nodes for the Hyper V Cluster to function normally. 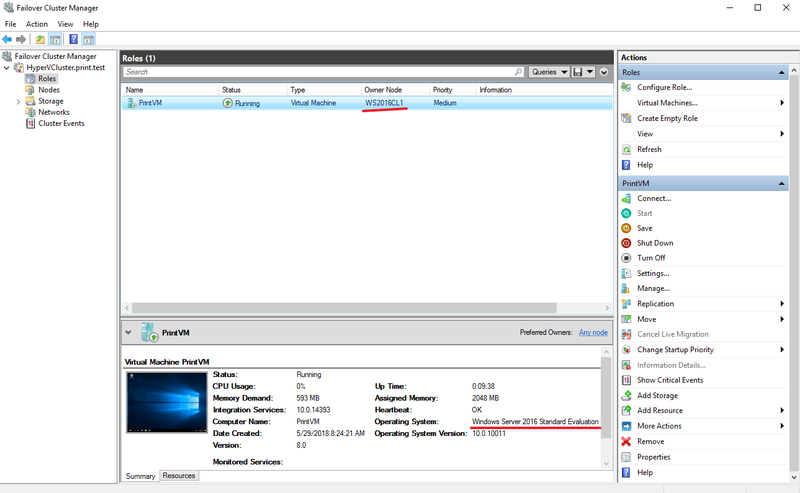 Hyper V Cluster on Windows Server 2016 can also be installed in “workgroup” environment. Tutorial will be available soon. 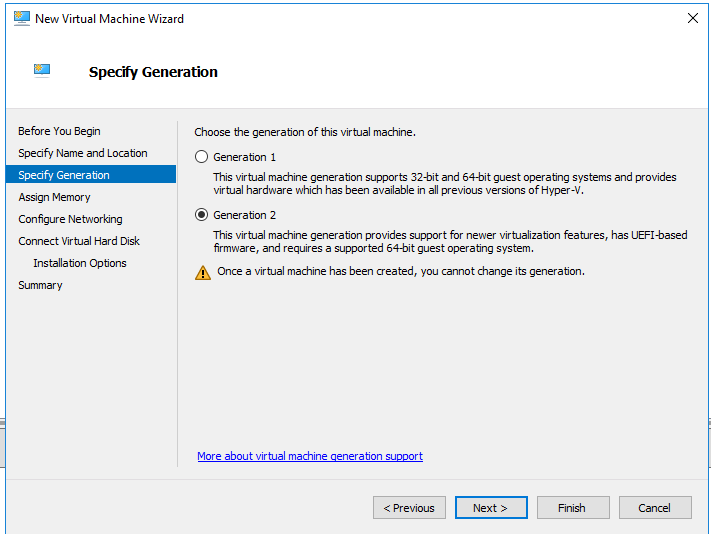 Downside of that type of Clustering is that you can only do Quick Migration of VM, Live Migration is not available. Quick Migration pauses your while transferring to another node while Live Migration moves VM workload without pausing. Have that in mind. 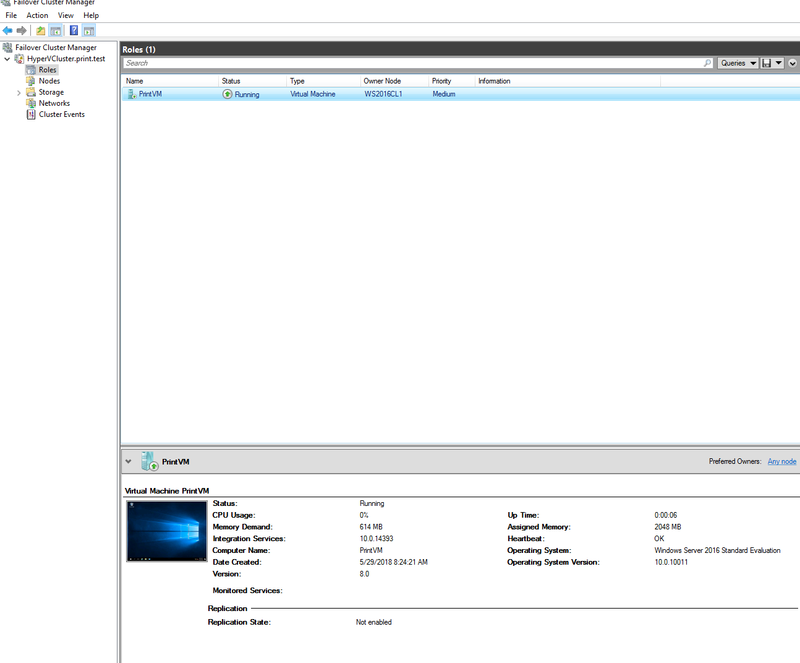 Now, after we checked all prerequisites lets go to the configuration of the Hyper V Cluster. 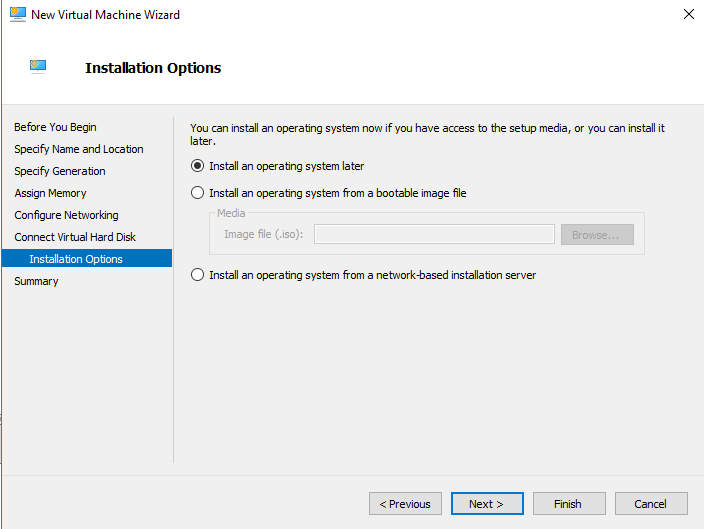 Rest of the procedure is mostly the same as you would install simple VM on Hyper V. Virtual machine location is the thing that you need to be careful about. 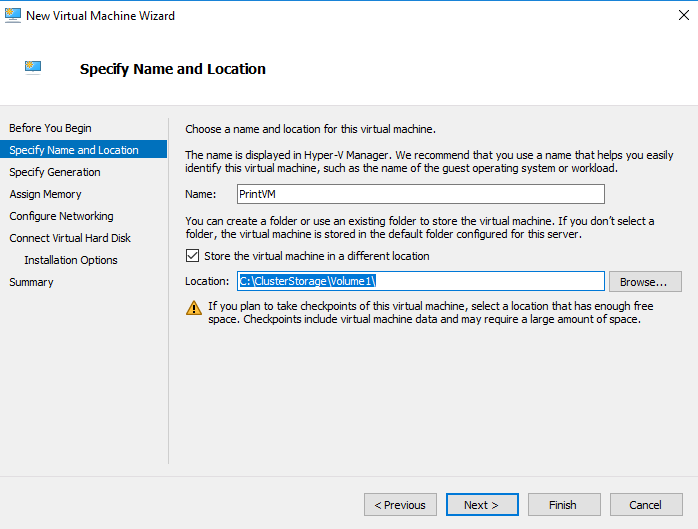 Now, give your VM a name and choose location. 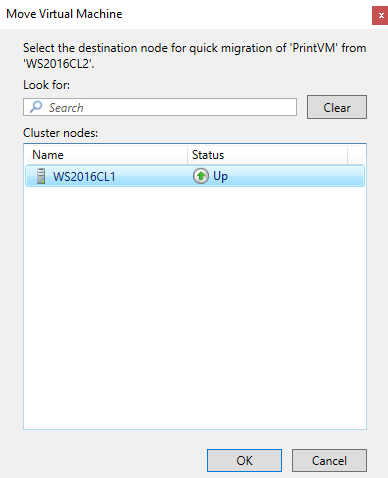 IMPORTANT– location has to be on Cluster Shared Volume in order for VM to be able to failover to another node. 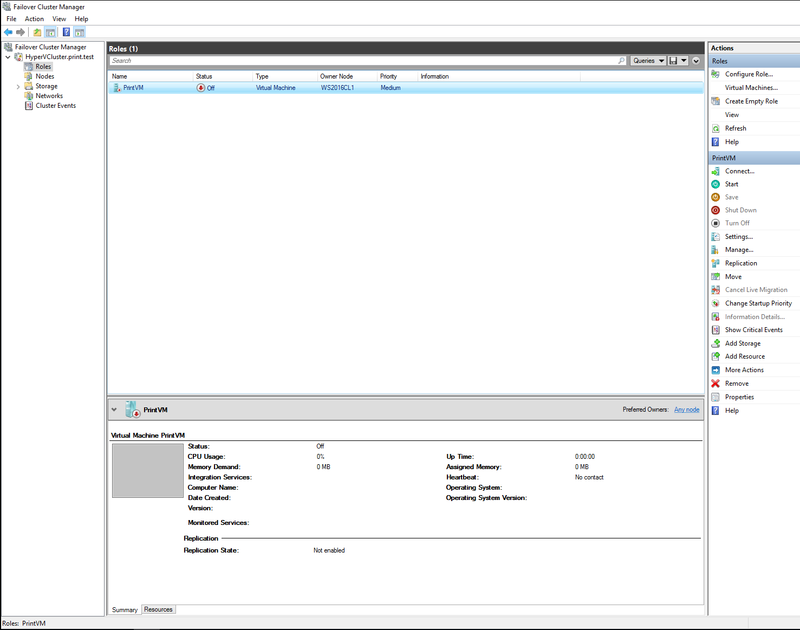 You configure Cluster Shared Volume in Storage section of the Failover Cluster Manager. Your virtual machines will reside on that storage and they need to be able to failover to another node. 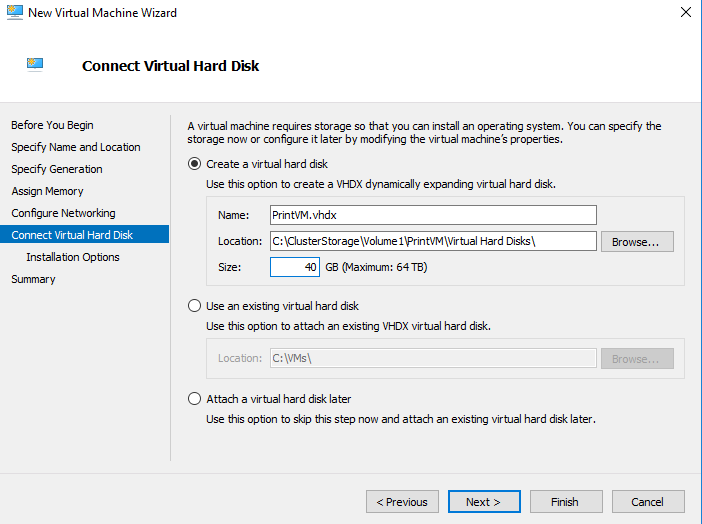 So, your entire VM (configuration and disks) should be in that location, be aware of that. I skipped the installation of the VM, but here is the result. 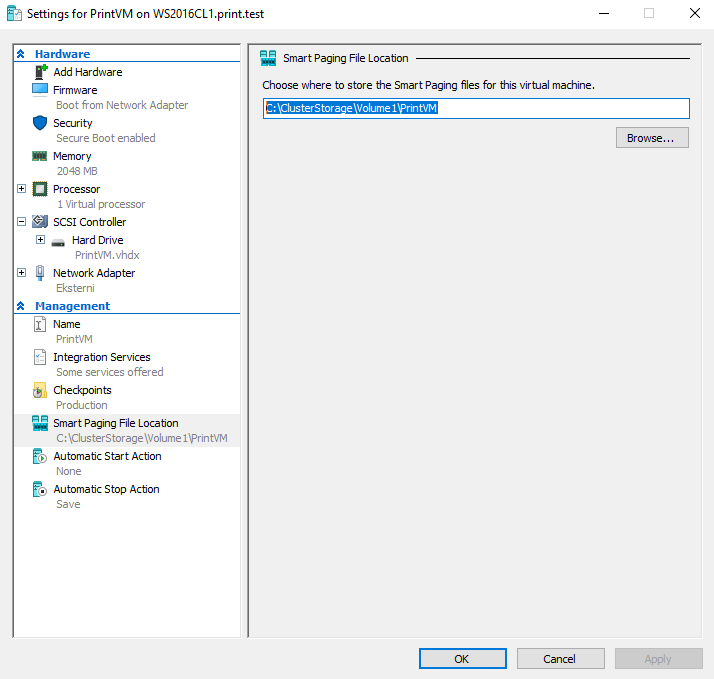 I installed Windows Server 2016 Standard and currently it is active on WS2016CL1 Node. Now we will attempt Live Migration (wont work in workgroup based cluster) and Quick Migration. Before attempting failover, be sure that you detached locally based storage or .iso image. You will not be able to migrate VM if something is locally based on one node, and not cluster shared. 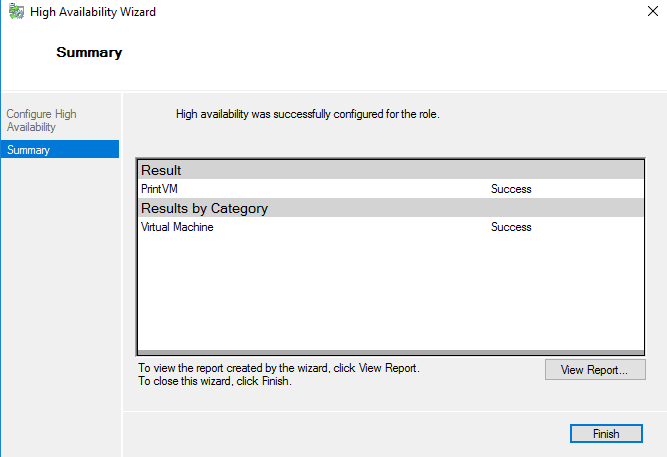 Cluster that hosts Hyper V VM is a success. There are few options like preferred node for VM that you can set and also some failover options, but that is a theme for another time.